Cover art by Rick Hoberg. What if the Fantastic Four had Different Super Powers? 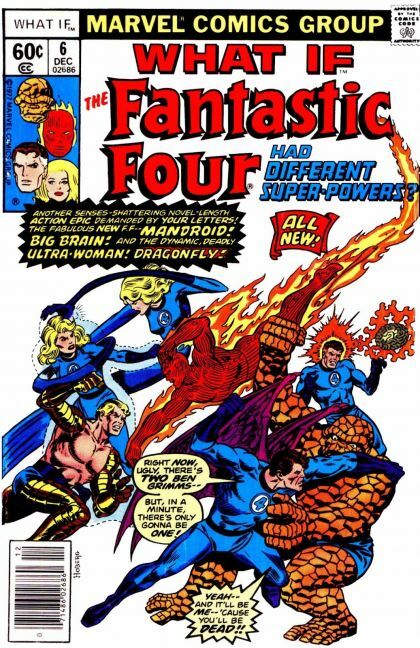 starring Doctor Doom, script by Roy Thomas, pencils by Jim Craig (pages 1-11) and Rick Hoberg (pages 14-45), inks by Sam Grainger; The Fantastic Four get alternate powers and become Big-Brain (Reed), Ultra-Woman (Sue), Mandroid (Johnny), Dragonfly (Ben). Hostess Cup Cake ad with Spider-Man. 52 pgs. $0.50. Cover price $0.60.